First Assistant Cook County State's Attorney Joseph Magats told CBS reporter Adriana Diaz that although the state is dropping charges against actor Jussie Smollett for faking a hate crime, he believes that Smollett is guilty. Magats told Diaz that he does not believe that dropping charges either "vindicates" or "exonerates" Smollett, who is still insisting that he did not pay off two Nigerian brothers to stage a late-night attack against him in Chicago last month, allegedly part of a self-promotion stunt by the actor to increase his pay on the TV show Empire. "Do you believe that he is innocent?" Diaz asked Magats. "I do not believe he is innocent," Magats replied. "So you believe he is guilty." "So why drop the charges?" Diaz asked. "Based on all the facts and circumstances, based on his lack of criminal background, we defer or do alternative prosecutions," Magats said. "In the last two years, we've done it on 5,700 other felony cases." Magats previously stated that charges were dropped because Smollett had done much "community service" and had "paid his bail." 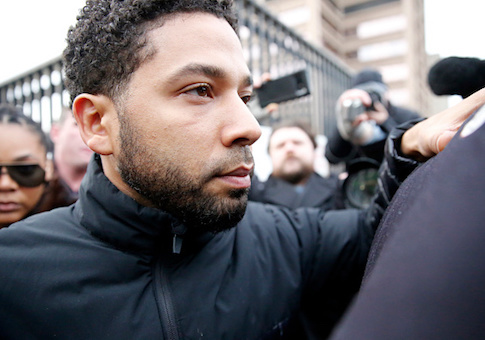 Chicago officials also expressed displeasure at the outcome of Smollett's case on Tuesday, saying that he unjustly maligned the city of Chicago as well as wasted the police department's time and money. Both Police Superintendent Eddie Johnson and Chicago Mayor Rahm Emanuel (D.) told reporters they were blindsided by the announcement. Emanuel also criticized Smollett personally, publicly asking the actor if he had "no decency." "You have a person using hate crime laws that are on the books to protect people who are minorities from violence, to then turn around and use those laws to advance your career and your financial reward?" Emanuel asked. This entry was posted in Culture and tagged Chicago, Crime, Rahm Emanuel. Bookmark the permalink.